One show, with The Castiles the sole act on the bill. The 27 song titles of this show plus two titles that are illegible have been culled from a surviving inventory /setlist document that was originally in the possession of a member of The Castiles. 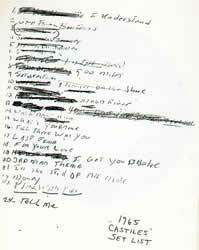 This list is believed to have emanated from a wedding reception the band performed in the autumn of 1965. With the exception of "Sidewalk" (co-written by Bruce) all of the songs are covers of other artist’s material, with the most recently released song at the time being Sonny & Cher’s "I Got You Babe" (July 1965). The setlist includes numerous 1964-1965 'British Invasion" hits by the Stones, Yardbirds, Kinks, Zombies and Beatles - a clear indication of the kind of music the band was playing at teen gigs. The high proportion of 1950s ballad material in this particular show (sung by George Theiss, not Bruce) is likely the result of it being a wedding, with manager Tex Vinyard making sure his boys also catered to the older relatives in attendance. These include the G-Clefs’ "I Understand", Acker Bilk’s "Stranger On The Shore", Don & Juan’s "What’s Your Name" and Anton Karas’ "The Third Man Theme". There is no circulating audio of any of this performance . Frank Marziotti has recalled the bride's choice of song was the jazz standard "Moonglow". Springsteen’s fortieth birthday and a quite significant bash in historic terms. Present and backing Bruce at the party was the entire E Street Band and Steven Van Zandt. On this night The E Street Band members were completely unaware that in less than four weeks (October 18, 1989) Bruce would phone them individually to inform them he was putting the E Street Band into semi-retirement, effective immediately. This would turn out to be the last Springsteen and the E Street Band performance together for over five years (until February 1995). Bruce plays a few bars of Ray Charles's "What'd I Say" before beginning "Spirit In The Night". 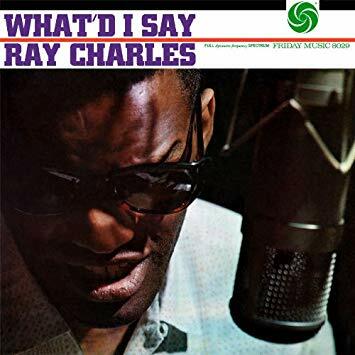 "What'd I Say" (or "What I Say") is an American rhythm and blues song by Ray Charles, released in 1959. As a single divided into two parts, it was one of the first soul songs. The composition was improvised one evening late in 1958 when Charles, his orchestra, and backup singers had played their entire set list at a show and still had time left; the response from many audiences was so enthusiastic that Charles announced to his producer that he was going to record it. After his run of R&B hits, this song finally broke Charles into mainstream pop music and itself sparked a new subgenre of R&B titled soul, finally putting together all the elements that Charles had been creating since he recorded "I Got a Woman" in 1954. The gospel and rhumba influences combined with the sexual innuendo in the song made it not only widely popular but very controversial to both white and black audiences. It earned Ray Charles his first gold record and has been one of the most influential songs in R&B and rock and roll history. For the rest of his career, Charles closed every concert with the song.